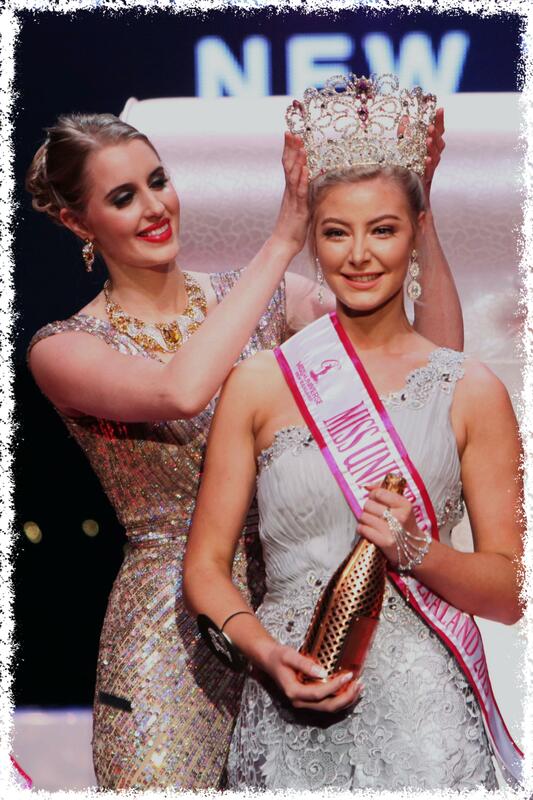 Samantha McClung was crowned Miss Universe New Zealand 2015, before a packed crowd at the Skycity Theatre, and an international audience watching the live stream at nextmissnz.com. McClung, 20, lives in Christchurch but spent many years of her childhood in the Marlborough Sounds. She is a qualified make-up artist who has worked in both Australia—McClung lived in Perth for 18 months—and New Zealand. McClung was overjoyed by the crowning but admitted it hadn’t fully sunk in. The title was decided by both an international judging panel and the voting public, with 50 per cent determined by each group. Special guest judges Ben Chan of Bench, one of the Philippines’ premier fashion labels, and MJ Lastimosa, Miss Universe Philippines 2014, flew in to Auckland to spend several days with the 20 finalists, in interviews and watching them perform live on stage. Both had the advantage of having met the finalists as part of their overseas retreat, which this year took place in the Philippines with the generous support of Bench, the Philippine Department of Tourism and the Tourism Promotions’ Board. They joined New Zealanders Megan Alatini, Steve Broad and Evana Patterson on the judging panel, whose scores were tallied alongside those of the voting public, who had been sending their votes since August. A sixth judge, Areena Deshpande, was unable to attend after giving birth last week. In addition to the crown, McClung drives away with the premier prize of a Honda Jazz RS Sport Limited, which is hers for the duration of her reign, as well as prizes from Bike Barn, New Face Laser and Cosmetic Clinic, Lipidol, Beau Joie champagne, and others. Presently McClung is spending the night at the Skycity Grand Hotel as part of her prize. She beat surf instructor Hannah Henderson from the Bay of Plenty and mental-health nurse Gabrielle Manaloto from Auckland, who came second and third. Once again, Miss Universe New Zealand partnered with Variety, the Children’s Charity, for which it had raised over NZ$60,000 in the previous two years.